Harold Edward Hale, 76 years of age of Raven, VA, passed away February 21, 2019 at his home. Born November 30, 1942 in Rowe, VA, he was the son of the late Walton and Goldie Ray Hale. Harold was a retired coal miner having worked for Jewell Smokeless Coal Corp as Preparation Plant Operator for twenty plus years. 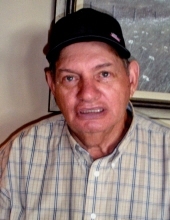 He enjoyed four wheeling, was an avid sports fan, especially NASCAR and football. A loving husband, father, brother, uncle and friend. Survivors include his loving wife Dreama Kay Rife Hale of Raven, VA; daughter Yvette Michele Trovato and friend Walter Martinez of FL; son Zachary Keen of Raven, VA; brothers Arlin Hale and wife Lois, Bill Hale and wife Freda all of Honaker, VA, Ralph Hale and wife Nancy of Lebanon, VA, Clayton Hale and wife Barbara of Rowe, VA, Kenneth Hale and wife Beth of Alexandria, VA, Bob Hale and wife Bea of Rural Retreat, VA; sisters Ruby Hurt of Smithfield, NC, Patty Ann Carter and husband Raymond of Manassas, VA, Cathy McGlothlin and husband Perry of Rowe, VA. He is also survived by his father-in-law Estel Rife of Raven, VA, grandsons Cody Wayne Deskins and Blake Austin Deskins, sisters-in-law Caroline Hale of Aiken, SC and Margaret Hale of Mavisdale, VA, several nieces, nephews and friends. Funeral service for Harold Edward Hale will be held at the Shortridge-Ramey Funeral Home of Keen Mountain, VA, Wednesday, February 27, 2019 at 12:00 noon with Reverend Troy Lester officiating. Burial will follow in the Greenhills Memory Gardens, Claypool Hill, VA. Active pallbearers will be Estel Rife, Kermit Rife, Zachary Keen, Blake Deskins, Michael Hale, Robert Ayers, Jr., Eric Ayers, and Jerome McGlothlin. The family will receive friends at the Shortridge-Ramey Funeral Home Chapel of Keen Mountain, VA, Tuesday, February 26th after 6:00 p.m. with evening service to be held at 7:00 p.m. The family of Harold Edward Hale have entrusted the care of their loved one to Shortridge-Ramey Funeral Home of Keen Mountain, VA.
"Email Address" would like to share the life celebration of Harold Edward Hale. Click on the "link" to go to share a favorite memory or leave a condolence message for the family.